The Mission Bay Conference Center at UCSF is an exciting new meeting destination, centered in UCSF's new 43-acre life sciences campus for teaching and research. Located just south of downtown San Francisco, the Center is steps away from the AT&T Park, shopping, premier hotels and entertainment. This stunning building offers a worldclass setting in the heart of Mission Bay. With 10 conference rooms totaling 12,500 square feet, we are uniquely positioned and understand how to facilitate a learning environment. These fully-outfitted facilities provide a stimulating environment with a range of technologically current presentation features designed to assist in the success of your event. Whether hosting for top-tier executives or creative think tanks, these conference rooms come fully equipped to meet all of your specific presentation needs. Our attentive staff operates with the intention of not just meeting your expectations, but also exceeding them. Mission Bay Conference Center, takes pride in being both service and satisfaction oriented. While you work the room or the projector, our dedicated staff works diligently to provide a level of assistance that contributes to the ease and success of your event. Our professional event planning team takes the phone tag, schedule shifting, and watch synchronizing out of event coordinating. A Conference Planning Manager will be assigned to your event and will ascertain your specific needs leaving you time to focus on the things that matter most to you. Our Day Meeting Package is available for bookings of 125 people or more. The package includes the following: Food: -Continental Breakfast -Continuous Beverage Service (8 hours) -Chef's Choice Lunch Buffet -Afternoon Break Station Audio/Visual: -(1) Podium & Wired Microphone -(1) In-house LCD Projector & Screen -(1) Flipchart w/Markers -(1) Easel -(1) Whiteboard 22% Service Charge is Included. A dedicated Conference Planning Manager to assist you with any and all details of your event. Our Bank of America Terrace can seat up to 300 people in rounds of 10. This is a lovely option for outdoor dining or reception space to enhance your event and give your guests a beautiful view of the outdoor space on the campus. Special Features: Screen built into the room. LCD Projector and other Audio Visual available at additional cost. Our beautiful covered deck can accommodate up to 50 guests for a reception or 40 guests seated in rounds of 10. This space can be rented for a private VIP luncheon or simply used as space for your guests to get a breath of fresh air in between meetings. Special Features: Covered Deck just off of the main event space on the 2nd floor. Atmosphere/Decor: Fisher Banquet Room has 2 full walls of windows that let in beautiful natural light. It is on our main floor and has direct access to the Bank of America Terrace and the Koret Quad. Special Features: Built-in screen and LCD projector. Six windows to allow in natural light. 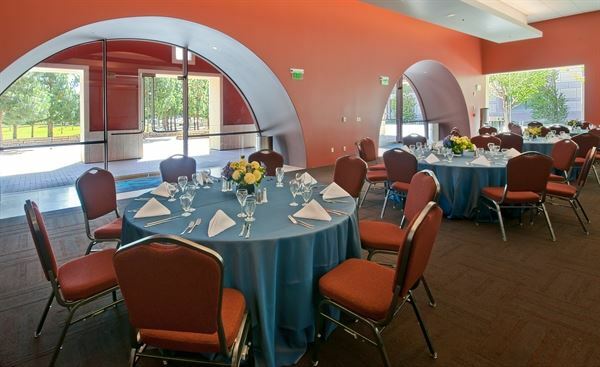 The East side of the Fisher Banquet Room features an 2 entire walls of windows with a beautiful view of Koret Quad. Special Features: The East side of the Fisher Banquet Room features an entire wall of windows with a beautiful view of Koret Quad. The Fisher Banquet Room can be divided into 2 using an airwall. The west side features a built-in screen and LCD projector and 2 very large windows that allows lovely natural light into the space. Special Features: The Fisher Banquet Room can be divided into 2 using an airwall. The west side features a built in screen for lcd projectors and other presentations. Robertson Auditorium is our largest space and can be broken out into 3 separate pieces; referred to Robertson One with the auditorium stage, and Robertson Two and Robertson Three which are exactly equal in size. All three rooms have built-in screens, but Robertson One, as the main room has the only existing projector. Robertson is on our 2nd floor and includes the Robertson Foyer space complimentary, which is a great location for the food and beverage for your program or registration space. Special Features: Complimentary 30 minute massage for client meeting planner. Stress balls included in every meeting package. Dedicated conference planner, in-house audiovisual consultants. Extensive fitness center, rooftop swimming pool, library.